FirePlotter is a real-time session monitor for your firewall. FirePlotter, simply shows you the traffic that is flowing through your internet connection moment to moment – in real-time. FirePlotter can also be described as a firewall traffic vizualizer, bandwidth analyzer, qos utility or connection monitor for your Cisco ASA/PIX firewall or FortiNet FortiGate firewall. 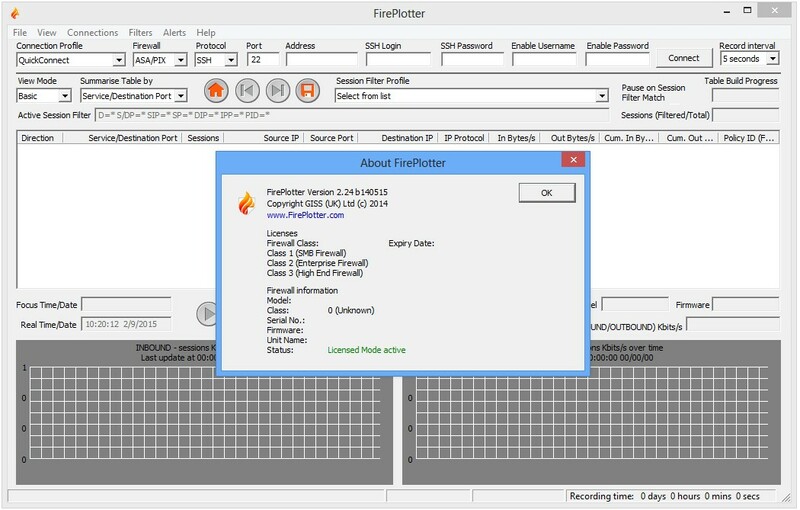 FirePlotter can replay all the session data it collects for further detailed analysis. Identify unfamiliar connections and find bandwidth hoggers. Explore Quality of Service (qos) issues. Track down hacker attacks, virus attacks or malware infected PCs. Check that email, web browsing, terminal sessions, file transfers, VPNs are working. Spot inappropriate internet usage by employees. Know when bandwidth or session count thresholds are being exceeded. Helpful tabular listings and summary of real-time traffic, including Basic and Advanced View Modes with sortable column headings including: Direction: Inbound/Outbound, Source IP Address, Source Port, Destination IP Address, Destination Port/Service (e.g. HTTP, SMTP, http://FTP…), IP Protocol (e.g. TCP, UDP, ICMP, PPTP/GRE), Number of Sessions, In Bytes/s, Out Bytes/s, Cumulative In Bytes, Cumulative Out Bytes. Installed and operational in less than a minute. FirePlotter uniquely retrieves it’s session data from your firewall using encrypted SSH (SecureShell) or open text Telnet protocol. Supports all Cisco PIX and ASA Firewalls (v6.x, v7.23 and above (more >>) and 8.x) and FortiNet FortiGate Firewalls (v2.8, v3.x, V4.x and V5.x). FirePlotter is a powerful real-time tool that can be used to augment Netflow analysis products. Session Filters and Download Filters can be used to focus on specific traffic data. FirePlotter can be configured to auto-connect to your firewall when you start the FirePlotter.